It's no surprise that ​the iPhone and iPod touch are loved by kids and teens the world over — and​ that they're commonly requested ​​​as holiday and birthday presents. They're also appealing to parents as a way to stay in touch with and keep track of their kids. Despite that appeal, parents may also have some concerns about giving their kids unsupervised access to the Internet, texting, and social networking apps. If you're in that situation, this article offers 13 tips for ways to set up an iPhone or iPod touch for your kids that keep them safer and don't break your bank. The iPhone and iPod touch require an Apple ID for set up and to allow the user to download music, movies, apps, or other content from the iTunes Store. The Apple ID is also used for features like iMessage, FaceTime, and Find My iPhone. Your child can use your Apple ID, but it's better to set up a separate Apple ID for them (especially once Family Sharing comes into play; see step 5 below). Once you've set up an Apple ID for your child, make sure to use that account when setting up the iPhone or iPod touch for them. How to set up an iPad. You can set the device on its own or do it using a computer. If you're setting the device up on a shared family computer, there are a few details to pay attention to. First, when syncing things like an address book and calendar, make sure that you only sync data specific to your child or your family (you may need to create a special family calendar or make a group of contacts for this). This ensures that your child's device only has information for them on it, rather than all of your business contacts. A passcode is an important way to protect the contents of an iPhone or iPod touch from prying eyes. 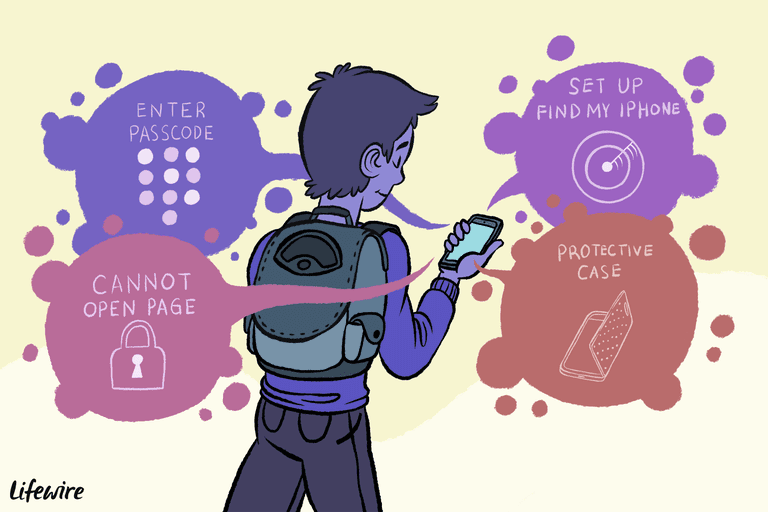 It's a security code that you or your child has to enter every time you want to use the device. You'll want one of these in place in case your kid loses the device — you wouldn't want a stranger to get access to any family information (more on dealing with a lost or stolen device in the next step). Make sure to use a passcode that both you and your child can remember. It's possible to reset an iPhone or iPod touch with a lost passcode, but you can lose data and there's no need to put yourself in a situation in the first place. If the device your child is getting offers it, you should use the Touch ID fingerprint scanner (or the Face ID facial recognition system on the iPhone X and newer) for an added layer of security. With Touch ID, it's probably a good idea to set up both your finger and your child's. Face ID only works with one face per device, so set it up using your child's. If your child loses their iPod touch or iPhone, or has it stolen, you won't necessarily be forced to buy a new one — not if you've got Find My iPhone set up, that is. Find My iPhone (which also works for the iPod touch and iPad) is a web-based service from Apple that uses the built-in GPS features of the devices to help you track, and hopefully recover, the lost gadget. You can also use Find My iPhone to lock the device over the Internet or delete all its data to keep it away from thieves. O​nce you've set up Find my iPhone​, which can be done as part of device set up, ​learn how to use Find My iPhone in this article. Family Sharing is a great way for everyone in a family to access each other's iTunes and App Store purchases without having to pay for them more than once. For example, let's say you buy an ebook on your iPhone and your kids want to read it. With Family Sharing, your kids simply go into the Purchases section of the Apple Books app and can download the book for free. This is a great way to save money and make sure everyone has the same content and apps. You can also hide more mature purchases so they're not available to your kids. The only weird wrinkle of Family Sharing is that once you've added a kid under 13 years old to your Family Sharing group, you can't remove them until they turn 13. Strange, right? Apple has built tools into the iOS — the operating system used by the iPhone, iPad, and iPod touch — to let parents control the content and apps their children can access. Use the Restrictions tools to protect your kids from inappropriate content and from doing things like having video chats (innocent enough with friends, but certainly not with strangers). Be sure to use a different passcode for Restrictions than the one used to protect the phone in step 3. What Restrictions you want to enable will depend on your child's age and maturity, your values and preferences, and a number of other factors. Things you'll want to consider limiting include access to mature content, the ability to use some apps, blocking in-app purchases, and limiting data use. If your child has their own computer, you may also want to also consider using the Parental Controls built into iTunes to prevent them from accessing mature material at the iTunes Store. If you're concerned about your child visiting websites with adult content, or just content not in keeping with your values, you may want to block certain websites. Learn how to do this in How to Block Websites on the iPhone. There are two kinds of apps you may want to install on your child's iOS device: those for fun and ones for safety. The App Store is full of terrific, versatile programs and there are tons of great games. (There's one kind that your child might be particularly interested in: free texting apps.) You don't have to install apps, but there may be educational or otherwise useful apps (or games!) you want them to have. Additionally, there are a number of apps that can monitor your child's use of the Internet and block them from accessing adult and other inappropriate sites. These apps tend to have both upfront and service fees attached to them, but you may find them valuable. Spend some time searching the App Store with your child and you're bound to find some great options. If you plan to listen to music as a family, or if you already have an individual Apple Music subscription, consider a family subscription. When you have one, your entire can family can enjoy unlimited music for just US$15/month. Apple Music lets you can stream virtually any of the over 50 million songs in the iTunes Store and even save them to your device for offline listening when you're not connected to the Internet. This makes for a great way to provide a ton of music to your kids without spending a lot. And, since up to 6 people can share a family subscription, you're getting a great deal. To me, this is an essential part of owning an iPhone or iPod touch, no matter your age. Kids have a habit of treating things roughly, to say nothing of dropping things. With a device as expensive as an iPhone, you don't want that habit to lead to a broken phone — so get a good case to protect the device. Buying a good protective case won't prevent your child from dropping their iPod touch or iPhone, of course, but it may protect the device from damage when it's dropped. Cases cost about $30-$100, so shop around for something that looks good and meets the needs of your and your child. Screen protectors can prevent scratches, ​avoid cracks in the screen, and reduce other damage that make the device harder to use. ​A package of a couple of screen protectors tends to run $10-$15. While they're not as essential as a case, the low cost of screen protectors make them a smart investment to keep an iPhone or iPod touch in good working order. While the standard iPhone and iPod warranty is solid, a child may accidentally do more damage than normal to an iPhone or iPod touch. One way to deal with that, and to make sure that your wallet doesn't get damaged at the same time, is to purchase an extended warranty from Apple. Called AppleCare+, the extended warranty generally costs $100-$150 (it differs based on the model iPhone you have) and extends the basic 90-day warranty that comes with all iPhones to two years of full repair coverage and technical support. Many people warn against extended warranties, saying that they're ways to companies to get extra money from you for services that are often never used. That might be true, generally, and might be a good reason to not get AppleCare for your iPhone. But you know your kid: if they tend to break things, an extended warranty might be a good investment. If you're thinking about protecting the phone with a case and buying an extended warranty, getting phone insurance instead might seem like a good idea. Phone companies will push the idea and say they add just a small cost to your monthly bill. Don't be fooled: Never buy phone insurance. The deductibles for some insurance plans cost as much as a new phone, and many insurance companies replace your new phone with a used one without telling you. Readers of this site have also reported dozens and dozens of instances of poor customer service from their companies. Phone insurance may seem tempting, but it's a wasted expense that will only frustrate you in the long run. If you want to invest in extra protection for your phone, AppleCare is a better — and often cheaper — bet. The iPhone and iPod touch ​can be addicting and your child may end up using them all the time. This can be a problem, especially for young ears, if they spend a lot of time listening to music. As part of giving the gift, learn about how using the iPod touch and iPhone can damage your child's hearing and discuss ways to avoid that with them. Not all uses are dangerous, of course, so you'll want to pick up some tips and stress the importance of following them to your child, especially since their hearing is probably still developing.